Centipedes are arthropods that have elongated bodies with one pair of legs per segment. They are distant relatives of lobsters, crayfish, and shrimp. They prefer moist areas, such as under stones, logs, or leaves. Even though the name means "hundred legs", the centipede doesn't really have that many; this one has about 40. The giant desert centipede is one of the world's largest species of centipede, growing to 6 to 8 inches (15 to 20 cm) long. It can be identified by its orange body and black head and tail. 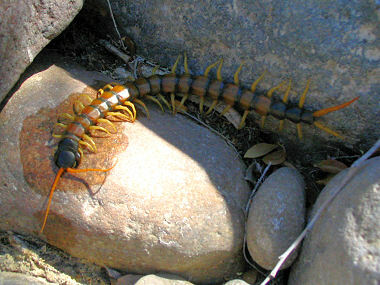 The bright coloration advertises the centipede as dangerous. Although the venom from this centipede is not considered deadly, the Giant Desert Centipede can give a very painful bite and the venom injected could leave a person in pain from anywhere between a couple hours to a couple days! The coloration of the giant desert Centipede make it difficult to determine which end is the head. This is a defensive strategy that may confuse predators to attack the trail, enabling the centipede to get away, or deliver a nasty bite. Centipedes use structures called gnathosomes or gnathopods to inject venom into their prey. These are paired pincer-like appendages in front of the legs. The “bite” is actually a pinch. Centipedes are fast-moving predators that feed on any small creatures they can catch - mostly insects, but occasionally other arthropods, lizards, and even small rodents. These fast-moving predators are more prone to drying out than many other species, so they are only active at night. Centipede mothers care for their eggs, coiling around them and grooming them. This grooming is thought to protect against mold and bacteria. Once the young hatch, the mother tends them as she did the eggs, until they disperse a few days later. Some centipedes have been known to live for up to 6 years.